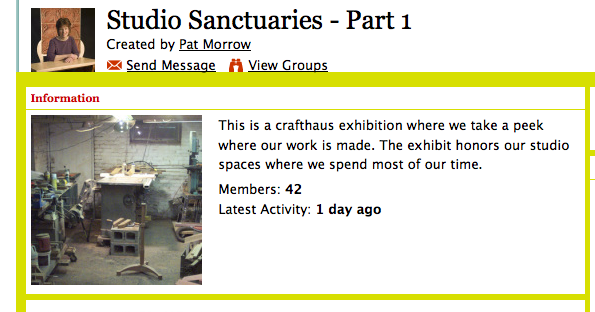 I invite you to visit the on-line exhibition “Studio Sanctuaries – Part 1“, created by Pat Morrow on the Crafthaus website. This exhibition will run until December 9th. Us convido a visitar l’xposició on-line “Studio Sanctuaries – Part 1“, creada per Pat Morrow al web Crafthaus. aquesta exposició es podrà veure fins el 9 de desembre. This entry was posted by Montserrat Lacomba at 7:25 am. | This post has no responses. This post is filed under Blog, Exhibitions and tagged with contemporary jewelry, Crafthaus, online exhibitions, Pat Morrow.